Is FIFA 19 fastest player faster than Usain Bolt? Wolverhampton Wanderers winger Adama Traoré claims he'd beat Usain Bolt in a race - but only under his conditions. 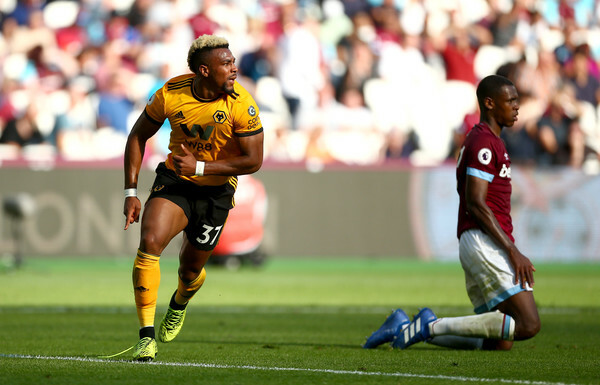 Adama Traoré of Wolverhampton Wanderers celebrates after scoring his team's first goal during the Premier League match between West Ham United and Wolverhampton Wanderers at London Stadium on September 1, 2018 in London, United Kingdom. The 22-year-old has been named the fastest footballer on the planet by experts at FIFA 19, beating Paris Saint-Germain forward Kylian Mbappé due to his greater acceleration. Traoré is taking the Premier League by storm as defenders are trembling at the thought of the wing wizard bounding towards them with the ball at his feet. The former Barcelona, Aston Villa and Middlesbrough man was once clocked at 21.73mph during a match against West Bromwich Albion in January 2017. Meanwhile, sprinting legend Bolt was running at an average speed of 23mph when he won the 100 metres sprint in the 2009 World Championships. And when the topic turned to Bolt, who has just made his debut for Australian A-League side Central Coast Mariners, Traoré is not embarrassed by the comparisons with the eight-time Olympic gold medalist. It is nice to be known on FIFA 19 as the fastest player in the world. But Usain Bolt has started playing for Central Coast Mariners so I might have a rival next season. Just remember, Usain didn't have to dribble a ball while he was winning his gold medals! Clearly Bolt would beat me over 100 metres on the track. But on grass, over 30 metres with a ball at my feet? I'm winning that race every time! It is completely different with a ball. I have trained with expert sprinters many times and they all agree running with the ball and running without the ball requires two completely different techniques. I was told I didn't have to lift my knees so high because I will never have to sprint 100 metres during a game. I usually sprint for 20 to 30 metres - occasionally 50 to 60 metres maximum. But no footballer ever sprints a complete 100 metres during a game. Likewise, Bolt trains to last the full 100 metres - he doesn't adjust every five metres to keep a ball under control!